The stereotypical office design often consists of an open office area with rows of desks and cubicles, with employees lined up in their small area where they work each day. Often, the cubicle walls and partitions are a drab color, such as grey that blends in with the other monotone colors in the office. These old style designs are becoming a thing of the past as office designers choose to incorporate commercial glass office dividers instead. One of the biggest problems with traditional cubicle walls and partitions is the fact that they decrease creativity among employees. People get tired of boring, grey walls and the walls are just high enough that people can’t see each other while sitting at their desk, resulting in minimal interaction between employees. Additionally, the room can get quite loud since it is an open space, making it difficult for people to stay focused on their tasks because of the noise in the room. If you want a productive team, then it is time to redesign your office and get rid of the cubicles. You will be amazed to see how much commercial glass office dividers can completely transform employee morale. 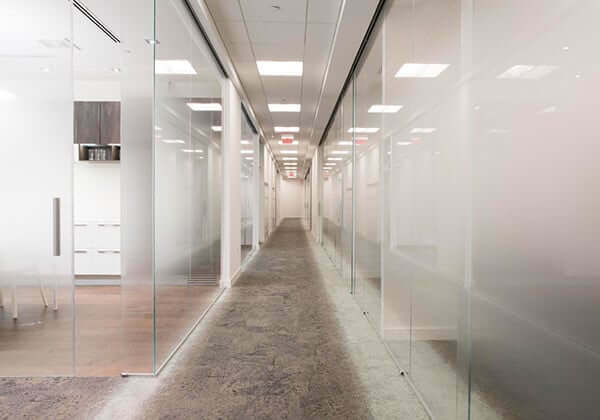 The main benefit to installing glass walls and partitions is the fact that they allow visibility throughout the office, while still maintaining privacy. If the glass runs from the floor to the ceiling, then privacy can be obtained by closing the door. But, visibility is still available through the glass, whether the office door is opened or closed. When people can see other team members in the office, it builds a sense of unity and connection. Communication increases, because people are able to interact with their co-workers more frequently. Another benefit of glass walls and partitions is that they allow natural sunlight to move through the office. Tall cubicles block the sunlight and make the desks darker. A lack of sunlight can have a direct impact on a person’s happiness and satisfaction throughout the day, which means that a glass office system can completely transform the office to help people stay happier when at work. The moment your client walks through the door of the office is the moment they experience a first impression of your company. If you want to build a good relationship with your clients, then you need to impress them when they visit your office. Glass office systems are a great way to set the right impression, because they make the office look modern and trendy. A modern design shows the clients that your company is forward-thinking, making them more confident in the products and services that you have to offer. Klein USA, Inc. is a leading provider of commercial glass office dividers that can be used in both commercial and residential properties. Are you looking for an innovative and unique design style for your office? Contact us today to learn more about the modern glass systems that can create clean, beautiful design elements in your office.